As you know I’ve been travelling a lot this month. I thought I would tell you a little bit about it with the help of the photos I posted on Instagram. First stop was Lisbon, in Portugal where we spent a day wondering the little beautiful streets. Wearing Dogstar clothing top (old) and Stella Carakasi skirt. Then we flew to Miami where I got to enjoy the beach for a day… wearing a flower tunic I have had for years and the sunhat I bought in The Netherlands. Find many more tunics here. and got a chance to sip some fabulous mojitos… Wearing my reversible Lizzy & Coco flower dress here. In Miami we boarded our cruise ship which took us to the Cayman Islands, Mexico, Belize and Honduras. Wearing an older flower top and the high low skirt from Zara. We also went to Savannah in Cuba for a few days where I wore my Lizzy & Coco reversible dress again the other way around. This is my favorite picture from Cuba. You can see the old and the new and one of the many old timers in the foreground. Back in Florida, we went to Quay West where we rented bicycles. Wearing my silk mini dress that I acquired in New York 2 years ago proving that you can wear silk for all kinds of occasions! After Florida we spent a few days with family in Los Altos in California and then I said goodbye to my family who went back to Singapore. I travelled further to LA where I met 40+style contributor Rosemond. Wearing new (very wide) pants from Filippa K and my older In Good Company top. In LA we also had a meetup with members of the 40+Style club, pictured here are myself, Gina, Rosemond and Tracy. I’m wearing my old long asymmetrial blouse by and Weekend by Max Mara pants. Booties are by Lilian (sorry can’t find these anywhere online!). I met my online friend Susan for the first time in real life. Right now I’m in New York where I sat down on the Brooklyn Bridge…. And met up with many fabulous friends: from left to right myself, Shauna, Teresa, Diana, Sue. When you meet such stylish colorful people, you need to look the part. I wore my new african print ‘suit’t by the brand Weekend by Max Mara. Could not find the exact same suit online but here is a top in the same print. Yesterday we got together with many of the fabulous women I met 2 years ago. 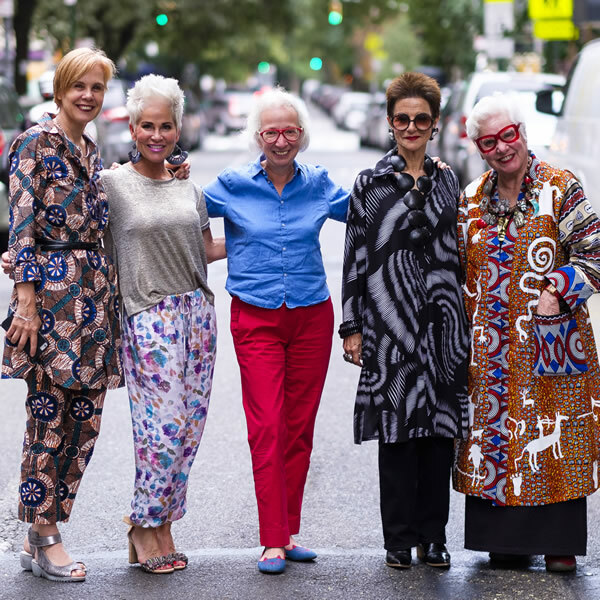 These women are definitely not afraid of color and print. 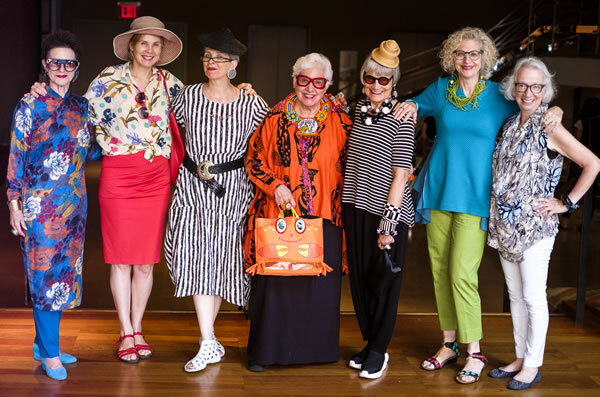 From left to right, Diana, myself (wearing old DKNY skirt and Essentiel blouse), Valerie, Sue, Jean, Dayle and Teresa. I’m going to be in New York for a few weeks more and if you want to keep track of my adventures, be sure to follow me on Instagram. Which of the above is your favorite travel outfit? I don’t have a favourite travel suit with you. They are all good. Although the reversable dress we found together in Alkmaar proves to be a really good purchase. You are having a really lovely time travelling and meeting people. The last picture of you all made me smile. It is a very happy picture and I wish all people could express themselves so well. All very outspoken, almost too outspoken to all be in one picture haha. Makes for a very lively conversation! I have more than one favourite look. I really like the blouse in Miami, the breezy outfit with the cruise boat in the background. I especially adore the dress in Cuba. Most important I like the carefree attitude on the bicycle.